DJ Sue's World of Music... 60s, 70s, 80s, 90s, and Beyond! Welcome to my blog. I’m a DJ in Second Life and I find myself discussing the music I’m playing with many of those in attendance at my shows. Unfortunately, when I am busy DJing, I can’t participate and discuss the music as fully as I would like. I’m hoping this blog can help change that. Look here before my set to see if I might be playing something interesting today or maybe after to see if discussion on a topic might continue. You are invited to join in the conversation and leave comments. It was almost two years ago that I posted here about the music that I most like to listen to. At that time I admitted to being a psych-head and that late 60s psychedelic acid rock is my greatest musical love. (See What Does Sue Listen to: Pt. 1 Farfisa and Fuzz, July 31, 2011) At the end of that post I announced a mini set that I planned to play at an upcoming show, to spotlight some examples of the type of music I love. The first song listed was a gem called “Strawberry Tuesday” by the Sidewalk Skipper Band. It is a great tune and a personal favorite of mine from that genre. The Sidewalk Skipper band was from Milwaukee and they began their career doing college gigs at Marquette University. The band consisted of David McDowell on lead guitar and vocals, Rick Novak on guitar, Brian Ballestrieri on keyboards, Joe Ballestrieri on bass and Tom Jukem on drums. By February 1968, they were signed with Capitol Records and in the studio recording in Chicago. 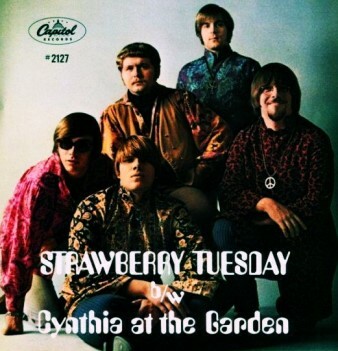 Soon they had released their first single, Strawberry Tuesday/Cynthia at the Garden. This was followed by a second single in May 1968, It's Raining Flowers in My House/Seventeenth Summer. So why did they never catch on? It might have had something to do with the way Capitol marketed them. It could be easily argued that the Psychedelic Movement originated in the United States, but it was British bands like the Beatles, the Bee Gees, the Stones and Cream who were taking it to a whole new level. It was all part of a larger movement called the “British Invasion,” and America was always looking for its next “response” to the invasion. It was quite overt with some bands, like Paul Revere and the Raiders. During this time, various psych bands in the UK were able to thrive by releasing 45 RPM singles, but this wasn’t the case in America. The American psych-head wanted to smoke a joint, or drop acid, and listen to an entire LP album side, without having to change the record after each song. Maybe if they had released a full album, they might have become a psychedelic household name like the Strawberry Alarm Clock or the Electric Prunes. A while back, a 12” acetate surfaced with more material, so obviously they did record more songs. By 1969, they had left Capitol and recorded one more single with a label called “Teen Town,” Jeanne at the Circus/Sidewalk Skipper. They disbanded shortly after that and the Ballestrieri brothers went on to open a club called the “Stone Toad.” Brian Ballestrieri would also go on and record as a solo artist, with limited success, in the 1970s. I found a 16mm film reel with the original 'music video' for Strawberry Tuesday. I had it transferred to video and uploaded. When I was a kid I had my Mom's 45 of Jeanne at the Circus/Sidewalk Skipper and I played it to death! I think the 45 is still in existence somewhere at my mom's house, though I am not certain, she may have chucked it when they sold out family home a few years ago. I'll have to look for my old, yellow case of 45s. I'm dying to hear those two songs again. When DJ is Streaming in Second Life, you can listen to her stream on your computer with nothing more than an internet connection and audio software such as iTunes or WinAmp. Remember, the times on her schedule above are Pacific Coast times in the United States. Sue's stream is located on the web, HERE. Music has always played a large part in Sue’s life. It was not surprising that she became a radio DJ in the late 70's and early 80s at an FM radio station in the New England area. Eventually she began DJing live events like dances and college parties. Even though she had been away from DJing for a considerable time, when she found Second Life, she rediscovered the joy of sharing music with others and this time she didn’t need to travel and drag around lots of equipment and many milk crates full of records. Sue is a regular DJ at a Woman’s Touch Island where she is also a manager. She also DJs various events in SL, for various organizations, including the Second Pride Festival, Relay for Life (The American Cancer Society), Fearless Nation, and others. She is comfortable working with many different genres of music and often mixes them together. Her regular sets are quite eclectic at AWT and she tends to pull songs together from numerous decades and several genres together. She is also very fond of taking and filling requests from her listeners. She also remixes her versions of both popular and classic tunes. Below are a couple of my remixes. I hope you enjoy them. There is a few seconds of dead air (leader) at the beginning at each. Please wait a couple of seconds for the songs to start.